Hi all, I think this is my first post here though I'm quite the nuisance on the keyboard forum. I have an Ibanez bass, a 4-string SRA550, a model that hasn't been made for quite a while. My main gig is keys but I double on bass for a few tunes with the band that's paying the bills for me. On a recent show I thought I broke a string but what happened was that the end with the ball just slipped out of the bridge where it hooks in at the end (is that the tailpiece?). I thought that might be a sign that my strings were wearing out so I started installing a fresh set tonight. Lo and behold I've already experienced the two new strings I've installed so far doing the same exact thing when I try to get them in tune. I don't know if I'm doing anything wrong installing them so I thought I'd post a few pics. I've looked at the "manual" that came with the bass but it's not much help. I don't see any other way the strings could go on, but maybe there's something I don't know – like I have the wrong strings? They're .045 - .100 (light gauge), so maybe the balls are too small to catch at the tailpiece? Anyway, right now they seem to be holding. I'm actually afraid to continue the install (still have the A and E strings to go). It just seems like there's not much "holding" area on this tailpiece and the strings could pop out any time. 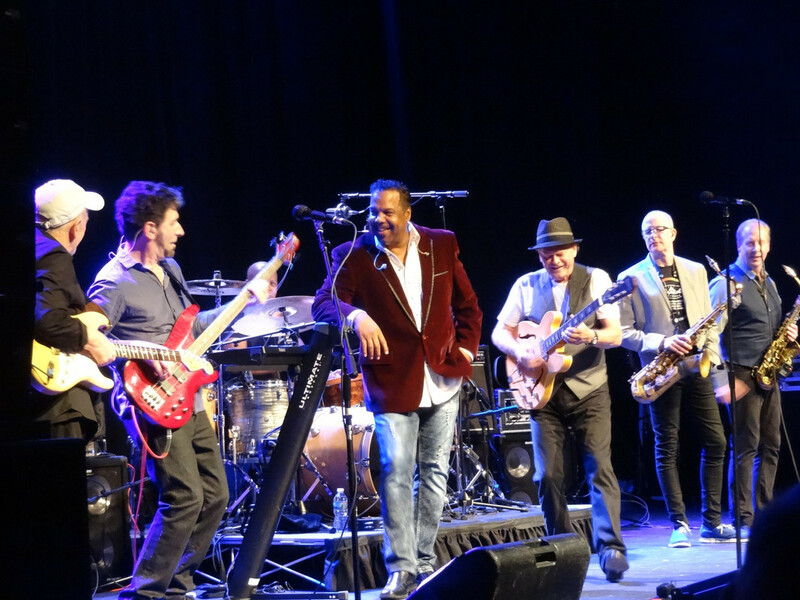 I'm playing three shows in the next three nights starting tomorrow night, opening for Tower Of Power! I don't want to repeat what happened last weekend! Any help, tips, etc. appreciated. Thanks! Unfortunately our Lowdown brethren don't come around much anymore, I'm in the same boat as you as a keyboard player who doubles on bass from time to time. I'm not familiar with that particular bass but the way the ball ends sit in the saddles doesn't look right to me. Don't know if it's just the design of the bass or if something else is going on, my best advice would be to take it in for a professional setup. May cost you $100 but they'll fix any minor issues, set action, intonation, neck, etc. If there is any issue with the tailpiece or just saddles, they will make a recommendation and quote a price to repair/replace. I don't see anything wrong with the tailpiece (though it's quite a bit different from my G&L - I could check out my Ibanez when I get home from work). It's possible that you need to rotate the ball-end of the string so it's perpendicular to the tailpiece itself. Similar to the E-string but a bit more centered. 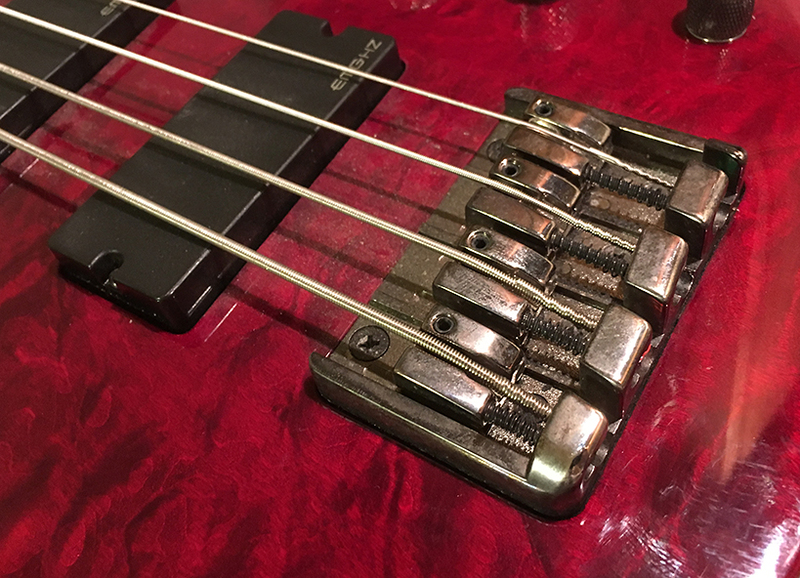 Loosen the other strings as well and turn them so they are straight up from the bass body (the G-string is close, but the A & D strings need a complete repositioning). That's the widest part of the ball against the opening and it should hold the strings in place firmly. You really don't want a bass malfunction if you're opening for ToP. That would be...unwise. Post a pic and let us know how it works out. I'm interested - I just had to replace the adjustable saddles for the strings on the G&L - one of the intonation screws came out at a gig and was lost and gone forever along with the tension spring. YOu can't get just the screw and spring - you have to order the whole set of 4 saddle inserts in order to get the parts. A $40 repair for a $.25 screws and a spring that used to be found in any pen. Oy vey. EDIT! Looking closer, is the ball opening for the D string a lot wider than the others? When you loosen the string to reposition the ball, you might consider tapping that saddle section down a bit. It definitely looks higher (thus more open) than the E or G string opening. Not sure about the A, but I'd tap down the D, definitely. Funny this should come up now. I bought a used (beat up) Ibanez SR305 jus the other week, and had a similar experience, though just with the G string. I had to rotate the string/ball end to sit just right back there. I also raised the saddle some, to increase the break angle and possibly change the tension between the back of the bridge & the saddle. Now, I was doing that because it was a "new to ME" bass. If you're happy with the action as you've set it, the just work with rotating the ball end. Of course, you could just ask Rocco to help a brother out and lend you his bass. Just to see if you like it enough to consider purchasing one of his signature products. Yeah, that's the ticket. Thanks for the replies. 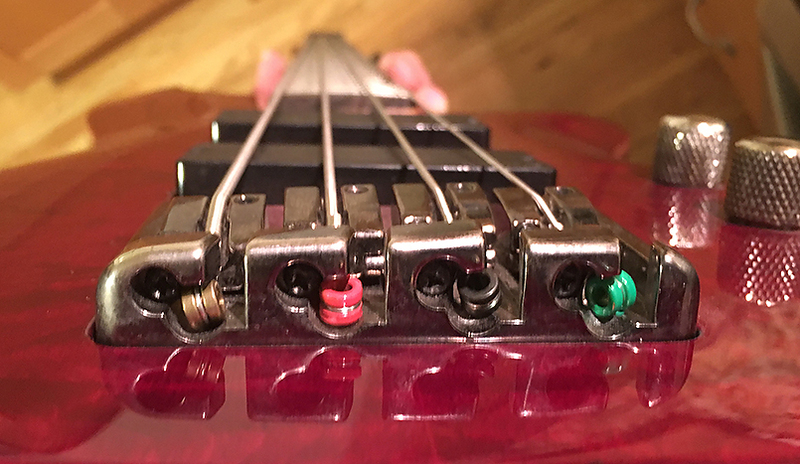 I have to be honest – the strings I had were put on a few years ago when I first got my bass, they just went in and held this whole time until the other night. I don't remember any issues when I put that set on. Flemtone, funny you should mention the ball opening for the D string – that's the one that slipped out on the show I was playing (see below)! Is it possible that string tension and some kind of flexing would enlarge that ball opening to the point a string can slip out? I did a google search on this last night but came up with nothing except complaints about strings slipping from Floyd Rose tremolos. That leads me to think that I was doing something wrong in the install, though I couldn't see what – how many ways can you thread a string through that bridge? Danzilla – I can't ask Rocco, he doesn't tour with the band anymore! 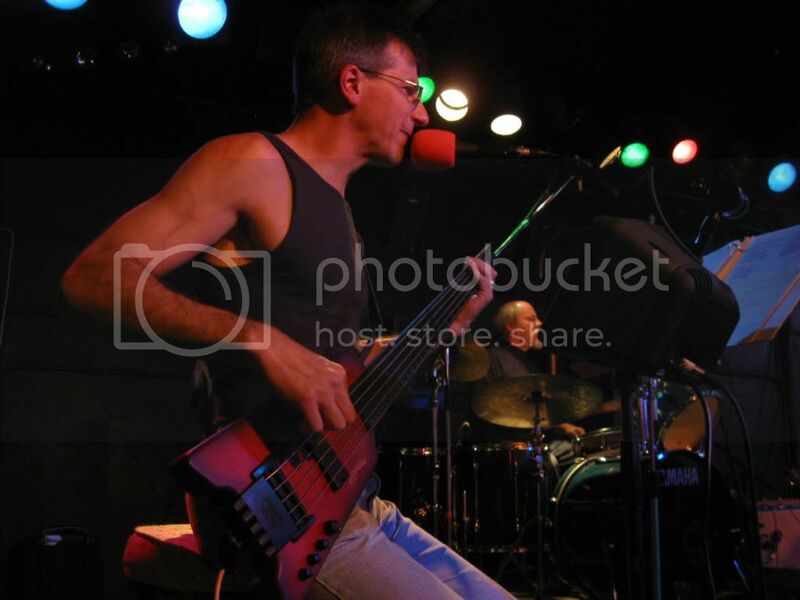 I dare not ask the real bass player of the band I play with, as he told me not long ago that I should get a "real bass"! Dan, I am definitely planning to have the bass looked at and set up properly. I've messed with the truss rod a few times and done some other adjustments but I'm getting some buzzing on a few frets and don't want to make the situation worse. The issue now is that I'll be on the road the next three days and just want these strings to stay put for that time. 3: tap (gently) with a hammer on top until the top moves down to be level with the other string clutches. Tap gently with the hammer. You want the metal to bend slowly, not bang away at it - that will make it weak and increase the possibility of it breaking. It shouldn't take much - you only want to move it a millimeter or so. As long as it's level with the other ones, you should be golden. Oh, and I think some of your buzz might be coming off the E string against the tremolo pickup. It looks really low from the pic in your original post. 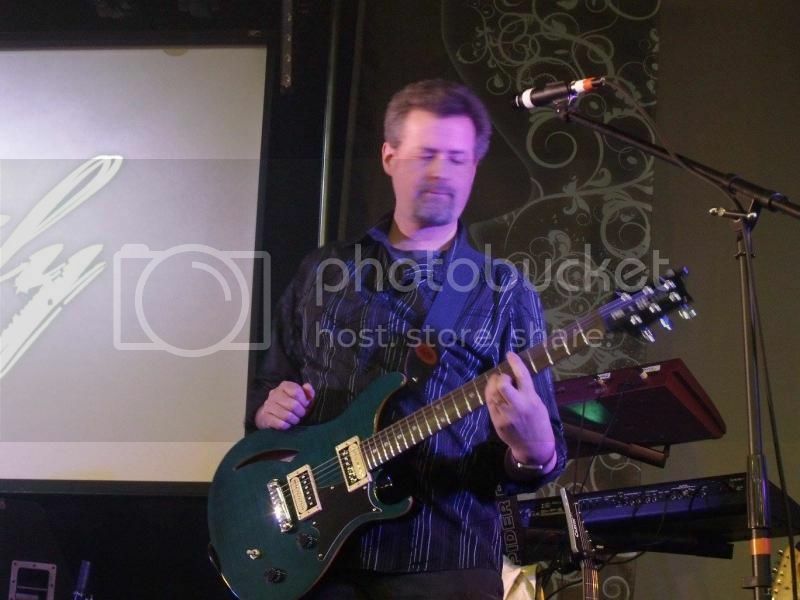 Notice the casual 'you're gonna play this solo for as long as I can stretch it out' look on the singer? That's a great shot. Next practice, drop a live frog into his pocket before he leaves. Yes. I agree. Bending that part down just a touch so it's flat across the top makes perfect sense to me, with ball end in proper alignment. Well I made it through all three shows without a string popping off the bridge. Just as I thought, I didn't have any time to address some of the ideas brought up in this thread – it was a short driving tour and we were on the road every day, arriving just in time to load in & sound check. I had to hope the strings would hold and they did. Now I have the name of a guitar & bass tech, who I will call and hopefully set up a time for him to give my bass a once-over: fix what's up with the strings, and maybe do some setup work too. I'll definitely let him in on what you guys have pointed out. Flemtone, nice catch on the D-string opening there. I did not notice that but it's plainly visible. I wonder how that happened – I use this bass very sparingly (I do zero gigs on bass, so it's only used for two or three songs a show with AWB – and we're not very busy at all). I have light gauge strings and I don't play with a lot of force. I suspect TSA had the bass out of its case and dropped it – there was a chunk of the finish gouged out after one airline trip. Thanks again everybody for the help! I didn't want to mention this earlier, but AWB is probably my favorite band in the universe. Alan Gorrie's basswork was what got me interested in playing bass way back in the Dark Ages of the early 70s. My soon-to-be wife and I saw them at a number of shows around then in the NY/NJ area (Belmont Park, Freehold, etc) and have pretty much worn out our vinyl copies of several of their albums. You, sir, are indeed fortunate to be able to play bass with, and in front of, Alan Gorrie. Please give him my regards and tell him that, when I grow up, I wanna be just like him. *PS - the solo isn't in 'TLC', is it? Thanks Flemtone – yea, I'm a lucky guy to have this gig. I too was a big fan of the band back in the day, and fantasized about playing in any band that had a similar style. In my youth I had an old P-Bass (still do) and used to play along with the Feel No Fret album, as well as the first Chaka Kahn solo record that had Anthony Jackson and Ferrone. When I got the call to join on keyboards but was told I'd also have to play bass on the tunes Hamish Stuart played bass on, I asked Alan to let me do it on keyboard bass but he wouldn't have it. Next thing I know I'm standing on a stage playing bass with Rocky Bryant, an amazing drummer that's worked with bass players like Will Lee, James Genus, Marcus, etc... yea I was nervous! It's such a kick to be playing some of the most iconic bass lines in r&b/funk: Schoolboy Crush, TLC, Cut the Cake (that's where I get my big solo feature), as well as songs like Soul Searching, Stop the Rain, Walk On By and a few more. It's the most fun I have on two feet! Thanks again for the bass help! My opinion is the bridge saddles need to be flat. Each one should be flat with itself. In other words both sides of the E string saddle should be the same height. Likewise with the A, D, and G strings. People slant them all the time thinking they should follow the radius of the fretboard. Check Dave's World of Fun Stuff on Youtube and look for bass setup.